The New Year is here: are you feeling as healthy and vibrant as you can be? If your holiday celebrations have left you vowing to turn over a new leaf once and for all, a food-based cleanse may be the perfect solution. Weight loss, increased energy, improved sleep, and reduced cravings are all results of detoxing. If you thought that starvation, strange liquid concoctions, and bulking up on a bevy of pills and supplements were all requirements for cleansing, forget everything you have heard! Cleansing with food is safe, and perhaps more effective, than drastic, harsh techniques. Ready to get clean? Bulk up on leafy greens, fresh fruits and vegetables, clean water, and high-quality protein sources. Focus on eliminating common food irritants such as: processed foods, wheat, dairy, soy, caffeine, and sugar. Read on for more tricks-of-the trade to set you up for cleansing success. 1- Scheduling Smarts: Planning a detox is like planning a vacation; you need to look at your calendar and see when you can take ‘time off’ from food and alcohol indulgences. Chances are you will never have a few weeks free of social commitments and mealtime obligations but be strategic and choose when temptation will be at a minimum. 2- Pre-Detoxing: Sugar and caffeine are the two culprits that cause the most withdrawal symptoms. If you are particularly sugar or caffeine dependent, try to wean off the stimulants fully before starting to cleanse. A sugar and caffeine-free diet help to keep cravings in check, energy levels up, and will make the removal of other ‘favorite’ foods much easier and less tempting. 3- Kitchen Cleanout: To make your cleansing plan easier to stick to, give your refrigerator and pantry a makeover. Get rid of the foods that tempt you. Do you like to mindlessly munch on candy after dinner? If it’s not in the house, your habit becomes much easier to break. Once cleaned out, take a trip to the market and stock up on leafy greens, citrus, berries, and cleanse friendly snacks so you can stay on track. 4- Exit Strategy: How you end your cleanse is just as important as how you begin. Give yourself a few days or a week to gradually re-introduce the foods you have omitted. You have just diligently worked to clean out your body, so it would be foolish to start throwing all sorts of toxins back in. People sometimes find that they have previously unnoticed sensitivities to wheat or dairy, and they feel so much better by continuing to leave them out of their diets. Others are shocked that their once overwhelming cravings for coffee, sweets, cheese, and/or bread have vanished. 1. Don’t show up hungry to a gathering. It makes no sense to starve just to stuff. Eat a small healthy snack before leaving home to avoid overindulging at the party. Consider a handful of almonds and a piece of low-fat cheese. 2. Budget your treats. Make a decision whether you want a cocktail or two, or a slice of pie. You shouldn’t take a break from budgeting your calories on Thanksgiving. Plan ahead and choose wisely. 3. Stay hydrated with plenty of water, seltzer, and soda water (sugar-free). Many people mistake dehydration for hunger. In addition, water helps us feel full. Also, alcohol and coffee can dehydrate your body, so keep hydrated by sipping water and sugar-free beverages. 4. Don’t hang around the food table. Find a spot away from the food table and you’ll find that “out of sight, out of mind” really is true when it comes to food. 5. Eat Slowly. Since it takes 20 minutes for your brain to register that you’re full, slow down and enjoy your meal. According to experts, putting down your fork between bites and eating mindfully is a sure-fire way to enjoy your meal and be satisfied with less food. 6. Bring a healthy side dish. You may not know what’s in the other holiday goodies, but by bringing your own dish, you’ll rest assured that you’re filling up on something nutritious. 7. Get enough sleep. When we’re tired, our hunger and fullness signals don’t work properly. We may crave more carbohydrates and tend to over eat unknowingly. Get at least 7 hours of sleep during the holidays. 8. Follow the 80/20 rule. Eat until you feel about 80% full, then wait 20 minutes for your body to register that you are full. Eating until we are 100% (or more) full causes overeating by 20% or more. 9. Try the plate method: Fill your plate with ½ vegetables, ¼ starch, and ¼ lean meat. If it doesn’t fit on your plate, skip it! 10. Get in some activity: Find the time to get in at least 20 minutes of exercise. Most gyms are open on Thanksgiving, so carve out some time to get the blood moving. Or, take a walk with friends and family and enjoy their company on the holiday. Sandy Sfikas is a registered and licensed dietitian in Chicago. She’s also a nutrition editor, writer, and blogger. She’s worked in clinical settings as well as fitness facilities. “Change is uncomfortable and if you’re not ready to make changes, I can’t force you. My clients do all the work, and I’m there to facilitate the process. I provide the tools and encouragement to overcome weight loss hurdles. Sometimes a complete lifestyle change is needed, and other times a few tweaks to their current diet can make all the difference.” To contact Sandy, send her an email at sands345@yahoo.com. Groceries can be expensive. Especially when shopping for healthy foods. Most think that it is cheaper to purchase process, refined foods or even fast food (think $1 meals at McDonald’s) that nutritious, wholesome options. So what can we do to save money but still eat healthy? Plan ahead: look in your frig and cabinets before you go to the store so you don’t buy something you already have. Also, think of meals for the week and shop off those menus. Eat a snack before you shop: we have all done it, shopped hungry and ended up buying more than what you need because it looked good at the time. Sign up for saver cards: most major grocery stores have discount cards and you really can save money with them. Shop smart and purchase items on sale. Watch your portions: eating the correct portion size saves on food amounts thus saves you money. Cut out on buying the “extras”: this includes items with no nutritional value, pop, baked goods, etc. They aren’t healthy and just add to your budget and waist line. Buy produce in season: foods in season are priced to sell. Produce in the off-season can cost 10x the amount as in season. Cheap produce in Chicago: farmer’s markets, and Stanley’s (1558 N. Elston). Bring your lunch to work: you can save an average of $30 a week if you bring your own lunch. Make more for dinner and bring the leftovers to lunch the next day. Cook with frozen, dried or canned foods: they are less expensive than fresh and are equally nutritional. Make sure to rinse canned goods for they are usually stored in a liquid that adds calories. Substitute protein sources: vegetarian options are often cheaper. Eggs, beans and tofu are priced lower than healthy/lean cuts of meat. Think smart about meats: usually it is cheaper to roast a whole chicken and cut it up yourself than paying a butcher to do it. Purchase smaller portions of meats and look for lean cuts like “loin” or “round”. Buy generic: all food manufactures have to meet the same standards so a Jewel brand is created the same as the name brand. Read the food label to make sure they compare nutritionally. Buy in bulk: Sam’s and Costco can save you money. Just make sure you are smart and actually use the items you purchase. Grow a garden: plant your own produce when you can (weather permitting) and save on buying your own. The Good News? Eating healthier foods can actually save you money, according to a 2002 study published in the Journal of the American Dietetic Association. The researchers found that when families went on weight loss diets, they not only lost weight but reduced their food budgets (WebMD). So shop right and right! Stanley’s (1558 N. Elston) cheap produce (tip: buy what you will eat within the next few days. In my experience produce goes bad fast from Stanley’s but it is totally worth the price if you plan accordingly. Costco or Sam’s Club (various locations) offers food in bulk and has healthy choices. Wake up and pour yourself a bowl of cereal? When you bought that cereal you were thinking it was a healthy choice for breakfast right? Or at least better than a muffin, or donut? Well unfortunately, cold cereal can be worse for your diet depending on what type you eat. Many cereals are loaded with sugar and calories so beware! Choose cereals with lower sugar, fat and calories and high fiber. General Mills chocolate Chex. (1 cup=175 calories, 3.5g fat and 10.5g sugar) IF you really want to eat cereal for dessert, even Cookie Crisp is better for you that chocolate Chex (save 40 calories a bowl which equals 4 lbs in a year). Kellogg’s Raisin Bran (1 cup=190 calories, 1g fat, 19g sugar). SUGAR! The main concept of this cereal is good, with bran and whole wheat, however with all the added sugar (sugar-coated raisins), you are harming your diet. Instead, make your own with wheat flakes with natural raisins. Post Golden Crisp (1 cup= 145 calories, 0g fat, 18.5g sugar). High sugar and no fiber, might as well be eating marshmallows for breakfast. Really like the taste of honey cereal? Eat Honeycomb instead and decrease your calories by 40% and lower your sugar intake. Quaker Natural Granola with Raisins (1 cup= 420 calories, 12g fat, 30g sugar). One positive, loads of fiber, however the fiber doesn’t cancel out all the calories and fat! 1 cup of this granola has the same amount of sugar as a Snickers bar! Instead, eat Quaker’s brown sugar oatmeal squares. General Mill’s Reeses Puffs (1 cup= 160 calories, 4g fat, 16g sugar). This should be common sense since any cereal with the same name as candy can’t be good for you. TRUE! If you really want a sweet cereal, Honey Kix at least has fiber added so you will get some benefits. Bottom line; don’t be fooled by claims on cereal boxes. Even if they say they are made with whole wheat, check the label and pay attention to sugar content, calories and fat. Stay tuned for the BEST cereals for your diet! Over the holiday weekend, I was able to finally get away to the lake in Michigan! My lake retreat has always been to the same little town where my mom grew up, a typical small, beach town. After shopping in town, I was excited to discover one of the newest stores in town, Sweet Seasons Orchards, an indoor farmers market store front! Not only did they have various fresh, in season fruits and veggies, but they also had great speciality items. One of my favs, green bean chips! A tasty, healthier treat that are all natural and made out of just green beans, salt and a very small amount of oil. The taste? Crunchy, with a hint of sweet, and salt. Are they healthier than green beans-no way! After doing some research I realized they are vacuum fried so warning-don’t munch mindlessly. Everything in moderation! Even though these are mainly green beans, the calories and fat can add up quick! Since I don’t get up to the lake very often, and I now am addicted to this treat, I wanted to see if I could find a do it yourself way to still enjoy these chips or even better, make them healthier (no frying)! Snap off the ends of beans (if fresh), toss them in a little olive oil (just enough to coat), sprinkle them with sea salt and roasted them in the oven on 425° for about 10-15 minutes on a baking sheet. Bottom line: These are not nearly as healthy as fresh green beans, but a lot healthier than regular chips! Snack smart and control your portions. Enjoy! The RAW Truth – Add Some Energy to Your Diet! Increased energy, weight loss, and overall improved health are all common claims of adopting a raw food diet. Sounds pretty good, right? The truth is the benefits of a raw foods diet extends well beyond these promises. While I am far from being considered a ‘raw foodie’ I make a point to have raw foods several times a day, and can say, with confidence, this simple act has been truly transformative: I’m not sluggish in the morning, have little interest in sweets and desserts, and have more energy than I did when I was 17! The basic premise of raw foods lies in understanding cooking temperature. It is believed that heating food (above 116 degrees) destroys enzymes that assist in digestion and absorption of food. There is also the notion that cooking destroys the energy and ‘life force’ inherent in whole foods. So, to reap the most benefits of adding in raw foods, say goodbye to any processed or chemicalized foods that you might currently indulge in, and bulk up on raw fruits, veggies, sprouted grains, nuts and seeds. Not sure you can do it? Read on for my simple tips to integrate raw foods into your diet that will be as tasty as they are effective. I’ve even included a favorite kale salad recipe. For more recipes, tips, and instruction, I will be teaching a cooking class featuring Simple + Fresh Raw Food Creations on Thursday, August 21 at Whole Foods – Halsted. Mention Healthy in Chicago when signing up and receive a $10 discount! 1- Drink Green: Breakfast is often the easiest time for people to load up on natural energizing fruits. I love suggesting nutrient dense smoothies to clients. The busiest people and pickiest eaters can all find ways to add lots of nutrition to blended drinks without sacrificing flavor. My number one tip? Add raw, leafy greens to your smoothies. Kale, spinach, chard, lettuce, parsley and cabbage are all all loaded with folic acid, iron, and calcium, and when mixed with your favorite fruits, the flavor is virtually undetected. Toss in pineapple or papaya for an extra enzyme boost. 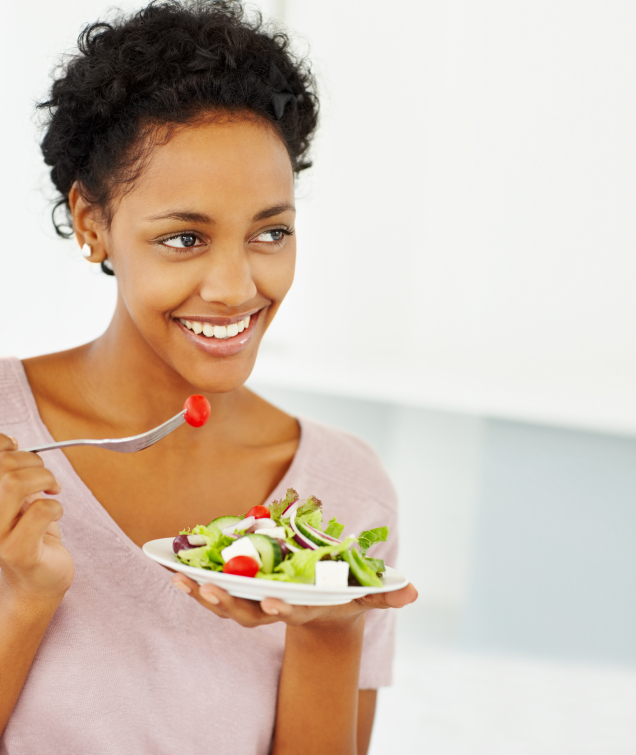 2 – Power Salads: Many people already consume raw vegetables in salads. Too add extra oomph, throw away your iceberg wedges and pre-washed bagged greens and trade up for hearty and healthy greens. I love finely shredding and marinating lacinato kale with lemon, olive oil, and salt to soften and infuse flavor. Collard greens, bok choy, and napa cabbage also work well. Check out the kale salad recipe I’ve provided below. 3- Super Snacks: The truth is, that many of us do not have the time or patience for the soaking, sprouting, and/or dehydrating that is commonly called for in raw food preparation. I love stocking up on goji berries, sprouted seeds, and raw sweet snacks at the health food store. Kai Foods makes a delicious sprouted sunflower seed mix, Two Moms in the Raw granola is insanely delicious, and I could eat an entire bag of Goraw Original Super Cookies. Amanda Skrip is a natural foods chef and wellness consultant in Chicago. If you are interested in achieving optimal health, visit www.amandaskrip.com, for recipes, upcoming classes, and current promotions. Mention Healthy in Chicago to receive a complimentary consultation to discuss how you can achieve your nutrition and wellness goals. This is a raw recipe that is so simple to prepare and so satisfying to eat. The lemon juice ‘cooks’ the greens, making them tender and tasty. For best results, allow the marinade to work its magic for a few hours before enjoying. Pack the salad in the morning and bring it to work for a fresh, cleanse-friendly lunch. Chiffonade the kale (cut into very thin strips) and place in a medium mixing bowl. Place avocado and goji berries atop. Squeeze lemon over mixture and add olive oil and salt. Using clean hands, gently ‘massage’ the mixture. Taste, and adjust seasonings to preference. Enjoy! Healthy In Chicago readers-Join us at the Chicago Urban Art Society (2229 S. Halsted) Thursday, August 12 from 7-10pm for an evening filled with tasty raw and vegan treats, organic cocktails, sustainable wines, whiskeys, sake, free massage, DJ, giveaways, raffle and much more to celebrate the official launch of YumUniverse.com! Wahoo! * Sparkling natural fruit beverages thanks to IZZE! There will be plenty of free parking behind our venue in addition to street parking. Cabs will be plentiful and we will even make sure that rickshaws are out front to take you on a pre-or post-party tour of Pilsen. Stop by neighborhood favorite’s like Skylark, Nightwood or Simone’s for a cocktail after the party. So stay tuned for developments—we have a lot of exciting additions in the works—but in the meantime, mark your calendar’s and RSVP for one of the sweetest parties of the summer!